Buddhist radicalism is on the rise in countries like Myanmar and Sri Lanka. Buddhist anti-Muslim rhetoric, violence against Muslim minorities and hate speech against UN officials are now global media sensations. Less known is the growing number of religious peace initiatives, by both Muslims and Buddhists, to address the situation. Recently, practitioners and scholars met in Bangkok to discuss ways forward. Both Sri Lanka and Myanmar have witnessed severe verbal and physical attacks on their Muslim minorities since 2012. For further reading on this, see for example The New York Times, The Democratic Voice of Burma, and Reuters. While it has been hard to prove who the perpetrators are, two things remain clear: 1) the attacks take place in an atmosphere of strong anti-Muslim rhetoric from certain Buddhist monk-led nationalist groups and 2) the (largely unknown) orchestrators and perpetrators of violent attacks operate with impunity. A common interpretation of the source of these attacks in both Sri Lanka and Myanmar is that of the “cronies”, that is, the economic elite, as well as the “evil state” and “evil politicians,” implying politically orchestrated violence between different religious communities. While this certainly might be the case, it should be noted that it has been difficult to establish links between the violence and different state agents, though in both countries some leading politicians and military officials have well-known relations with some Buddhist monks associated with the nationalist movements. For further reading on the situation in Myanmar, see the East-West Center. However, what remains clear is that both states have failed systematically in protecting their Muslim minority groups. In addition to representing violations of the right to life, the right to non-discrimination and the right to freedom of religion or belief for each individual, the escalating levels of religious intolerance also represents a serious threat both to local communities as well as to the states themselves. The new Buddhist radicalism is transnational in the sense that Buddhist radical groups in Myanmar and Sri Lanka see their own challenges not only from a local point of view, but understand these within a regional, or even global, framework. What we witness now is a new form of Buddhist revivalism similar to those seen in both countries during the colonial and early independence periods, but which is less tied to local communities than before. Still, ethnicity is of utmost importance to these new radical groups, but the new form of political Buddhism reflects a modernist twist as it transcends the boundaries of the nation state and goes regional, even global. For example, radical Buddhist groups like the 969 in Myanmar nurtures close links with the Bodu Bala Sena (“The Buddhist Power Force”) of Sri Lanka. This political Buddhism shares with its prior manifestation a concern for state protection of Buddhism, but is transnational in its resistance to what it understands to be “the Islamic threat,” particularly the global spread, noticeably into Asia, of conservative expressions of Islam and forms of Muslim violent extremism. In this situation, what we see are both stronger attachments to Buddhist identity vis-à-vis other religions, as well as a new regional concern about religious minorities and majorities in Asia. What happens to Muslim minorities in Myanmar matters in Indonesia and Malaysia, and what happens to Buddhist minorities in Saudi Arabia or Bangladesh matters to those in Myanmar and Sri Lanka. There is a broader Buddhist political consciousness at play, and an increasing sense of local connection to a wider Buddhist sangha, at least among the Theravada world. Modern forms of media and information sharing fuel these connections. But this same sense of broader connectivity also fuels many religious peace initiatives across the region. Recently, nearly 30 practitioners and academics working across Theravada contexts met at one of Thailand´s leading universities to discuss various strategies for religious peacebuilding in the region. The increasing level of hate speech by religious leaders, new forms of religious intolerance in social and legal norms, and increasing numbers of violent confrontation between different religious communities are met with great concern, not only by Western states, the UN, or international non-governmental organizations like the Human Rights Watch or Amnesty International, but more importantly, by local and regional civil society organizations and religious leaders themselves. While not denying the importance of international engagement, discussions on issues like inter-communal violence, the place of religion in the public sphere, or legitimate or illegitimate restrictions on freedom of religion or belief must be addressed within the religious communities themselves. So far, the most important and top-level initiative is the “Yogakarta meeting” in Indonesia. In March 2015 religious officials from across the region met to discuss Buddhist-Muslim relations and to foster mutual peace and understanding. 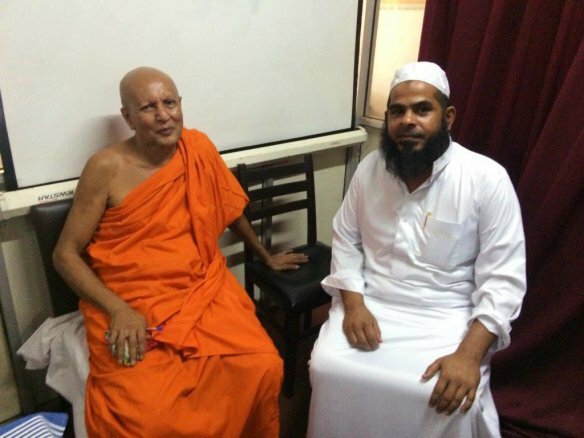 In their declaration they state that “Buddhism and Islam have been misused by some for their own political purposes to fuel prejudice and stereotyping and to incite discrimination and violence.” And they pledged continued work to promote inter and intra-religious education, conflict prevention, and positive engagement with the media. Statements crafted by local religious leaders like that of the Yogakarta declaration, endorsed by several authoritative Buddhist and Muslim organizations, carries much more weight than any human rights’ groups’ condemnation of the role of religious leaders in creating intolerance and mistrust. Also, several exchange visits in the region have brought peacebuilders from one national context to another to share effective strategies at addressing similar challenges. These transnational efforts compliment the quiet work being done in local communities led by religious actors to strengthen inter-religious coexistence and transform the drivers of violence, done with the encouragement and input of other likeminded peacebuilders from the region. Finally, various initiatives are being taken by Buddhist organizations outside of the region, for example by the Buddhist Federation of Norway, which through close cooperation with Buddhist monastic organizations in the region facilitates discussions on human rights and religious freedom from a Buddhist normative point of view (http://www.buddhismreligiousminorities.org). What can religious peace initiatives offer? First, they can challenge exclusivist discourses by pointing at diverse theological interpretations of a given situation. In the case of both Myanmar and Sri Lanka what is at stake according to radical Buddhists is the very survival of Buddhism vis a vis the “Islamic threat.” The question, then, is how one is to protect Buddhism in a way that does not imply violations of the rights of non-Buddhists, or in a way that might foster communal conflict. This requires an intra-Buddhist debate on Buddhist principles, religious pluralism and human rights, for example like the conference in Bangkok, or the religious minority initiative taken by the Buddhist Federation of Norway. Second, religious peace initiatives might offer alternative spaces for cooperation between religious communities, for example through a shared interest for the common good. Many of the initiatives discussed at the Bangkok meeting addressed the best ways for improving health care, education and access to resources for all, or environmental issues, across religious communities. Also, the role played by traditional, as well as social, media as drivers for religious intolerance was addressed. There is a need to communicate lived experiences of peaceful co-existence across religious divisions. Pitfalls and possibilities. “Religious peacebuilding” is a vague notion, often romanticized and promoted by “religious peace-builders” themselves. There are many pitfalls to be recognized: the limited impact of religious leaders upon their communities, their lack of independence from the state and the danger of top-level talk with little impact on local social and political realities. However, the rising levels of religious tension require the engagement of religious actors, unless exclusivist ideologies, intolerance and violence are to win.